This kind of love felt between couples to be wed and the celebration of that love through holy matrimony is a joyous occasion for the whole Church — unless there are misunderstandings between a couple and their parish about what is acceptable for a Catholic wedding. As the Albany Diocese strives to be pastoral and welcoming to couples who wish to marry in the Church, people like Mary Fay help work out what she calls “miscommunications” between couples and parishes. Mrs. Fay is associate director for marriage and family ministries for the Diocese. One rule at many parishes is that couples should be registered as parishioners — usually, for at least six months prior to their wedding — if they wish to marry in the parish. A recent article in Commonweal magazine, a Catholic journal, describes parishes struggling with the idea that couples should both adhere to Church norms and be welcomed so that they choose a sacramental marriage. 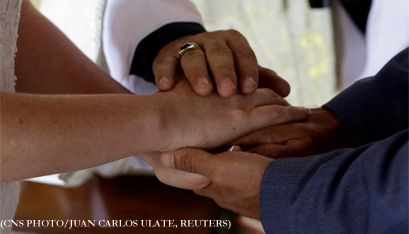 Some parishes don’t wish to marry couples who would not be committed to attending for an extended period of time. Bishop Christopher Coyne of Burlington, Vt., speaking at the Albany’s Autumn Diocesan Gathering in 2017, noted that his nephew had been turned away from marrying in a parish in his diocese because he wasn’t a parishioner. However, in the Albany Diocese, Mrs. Fay said, it is uncommon for parishes to turn away non-parishioners hoping to schedule a wedding. She said the Diocese is “very welcoming” in trying to honor Pope Francis’ call to be more pastoral to engaged couples. While there are diocesan guide­lines, each parish is also free to have its own guidelines for weddings. Rev. John Rosson of St. Mary’s in Cooperstown, for instance, celebrates a number of “destination weddings” of couples who are not residents of the Diocese but wish to marry in historic and beautiful Otsego County. Father Rosson explained that couples do need to understand that the sacrament of marriage means a great deal to the Church and any given parish can’t accommodate every wish. Many parishes, for example, prohibit the throwing of rice because it isn’t environmentally sound, or discourage placing a runner down the aisle because people could trip over it. Father Rosson referenced one time when a groom thought it would be acceptable for his four poodles to attend the wedding ceremony. “If it’s not appropriate for the sacrament, don’t do it,” is the pastor’s answer to such inquiries. Some couples have asked to perform “sand ceremonies,” a trend in which each partner pours different-colored sand together to form a unified color. Such an activity would be great for the reception, said Mrs. Fay, but to perform it during the wedding ceremony would be a distraction from the sacrament of marriage. “I’ve heard some wonderfully compassionate stories from pastors and deacons over the years who hear something that they normally wouldn’t do for a wedding, but because the couple has a very good reason, maybe to honor a family member they lost, I think they were pretty open and flexible,” she noted. Last year, Mrs. Fay joined Rev. Anthony Barratt of the diocesan Prayer and Worship Office and Rev. James Donlon of the diocesan Tribunal in leading a workshop on the rite of matrimony. The trio discussed “best practices” for parishes in accompanying engaged couples through sacramental marriage. Mrs. Fay hopes to hold another information session this winter.